The latest rumor swirling around Christopher Nolan's third Batman film reveals one of its villains and the actor who'll play him. The anticipation for Christopher Nolan's next Batman film, recently revealed as The Dark Knight Rises, is so great that fans just can't stop talking about it. Though Nolan has been extremely tight lipped about the movie's plot, a new rumor could finally reveal one of its villains. A source with Batman News that has reportedly been reliable in the past with information that included the Riddler's exclusion from Rises and names of actresses in the running for the movie's lead female role (possibly Catwoman), told the site that Hugo Strange will be one of the film's main characters. 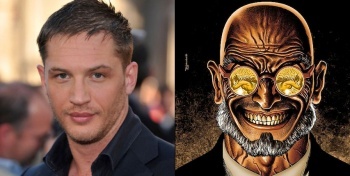 Inception co-star Tom Hardy is said to be playing a major part in Rises, and the source "strongly believes" that Hardy will be taking on the role of Strange. Hugo Strange fits Nolan's defined criteria for a villain in Rises because he's not well-known like the Joker or the Riddler. In the Batman comics, Strange has been anything from a mad scientist to a psychologist, but one common theme in his mythos is that he eventually discovers Batman's true identity. If Strange is in Rises, I would hedge my bets that he discovers Bruce Wayne is Batman as part of the movie's plot. As a reminder, this is all just speculation based on rumors, but when Nolan has given us so little to work with what does he expect? Here's hoping that Nolan gets badgered enough about revealing more Dark Knight Rises details that he actually gives us some before the movie is released in 2012.